Combine oil with Knorr Hickory Smoke Barbecue Sauce. Skew the prawn 2pcs each. Grilled on the hot plate to tender. Serve immediately. Blend shallot, garlic, young ginger, galangal, lemongrass into paste. Saute the blended paste with corn oil. Add water, Lady's Choice Creamy Peanut Butter and Knorr Chicken Stock. Simmer to thicken the sauce. Set aside to cooling down the temperature. Mix the peanut sauce with Lady's Choice Real Mayonnaise. Stir well and ready to use as dipping. 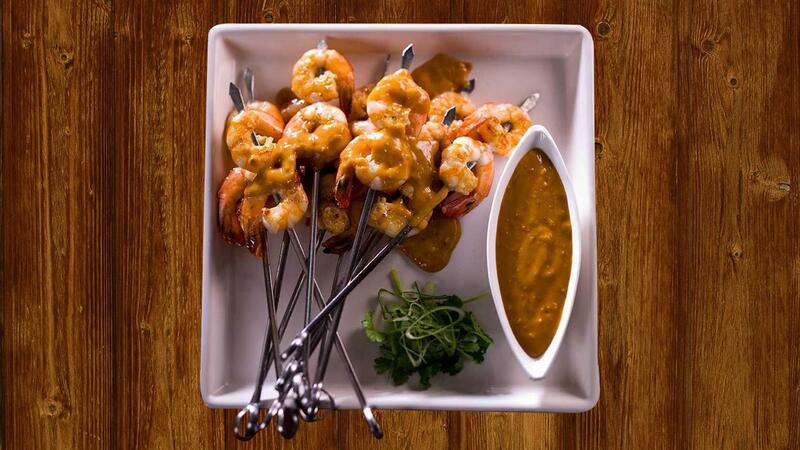 Drizzle the grilled skewer prawn with peanut sauce. Serve the peanut sauce in the dipping bowl. Garnish with coriander leaf and slice shallot.